The sand at Sunstate Sands Bundaberg – Coonarr Creek mine is pure white, high grade silica sand of about 99.8% silicon dioxide. The Sunstate Sands resource is unusual in that it can deliver material from below 250 microns up to 5mm. The company has graded the resource into three major products. These in fact occur as layers upon each other commencing with the superfine at the top and finishing with very coarse material at or below the water table. The resource varies from mining lease to mining lease and within each lease, analysis has shown the resource can be broadly identified into. 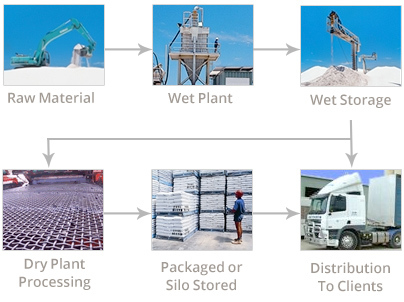 Raw material is extracted from the selected mine area, processed through a wet plant, stockpiled, then selectively processed through a drying plant. It can then be supplied either in bulk tankers, bulk tippers, or packaged in bulk bags or 20kg bagged on pallets. 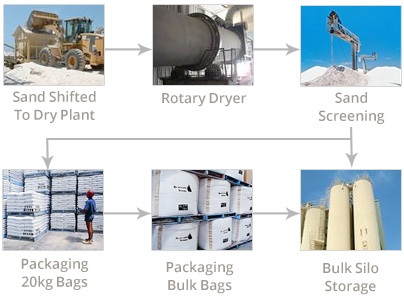 The raw material is extracted and transported direct from the mine and loaded into hoppers feeding the wet plant. The purpose of the wet plant is to remove all foreign debris, and produce an initial segregation of raw material into the following sizes. The sand is reloacted from the wet storage stockpile to the dry plant. It then passes through a rotary dryer to be distributed across various screens and shakers to be graded in order to produce a range of product to meet individual customer specifications. Bulk Silo for (tanker and tipper distribution) of -600um or -1+250um. 1 Tonne – 1.5 Tonne Bulk Bags. 20 kg (64 bags to a pallet, 1.28 Tonnes).